Burning Question: Why Do People Walk Across Hot Coals? In 1986, motivational speaker Tony Robbins explained his fire walking ritual to a captivated audience: "People have gotten first, second and third degree burns . . . Some have had skin grafts and three people have died...None of them attended my seminar." As of Thursday, that's no longer true. During a four-day seminar in San Jose, California entitled "Unleash the Power Within," 21 participants in Robbins' famed "fire walk experience" suffered injuries, including second and third degree burns. The walk across hot coals has been a staple of the immensely popular self-help guru's mind-over-matter transformation. "We have been safely providing this experience for more than three decades," reads a statement released by Robbins' office. "We continue to work with local fire and emergency personnel to ensure this event is always done in the safest way possible." Thursday's event has brought renewed attention to a practice that can be traced back over 3,000 years, long before head-piece microphones, conference centers, and bestselling books on the power of positive thinking. From Taoists to Native Americans, and from Japan to Bulgaria, the ritual has been used to instill faith, be it in a higher power, or in one's self. Tolly Burkan, a modern day advocate of the practice and leader of coal walking seminars around the country, believes the practice can improve physical health and increase "personal power." 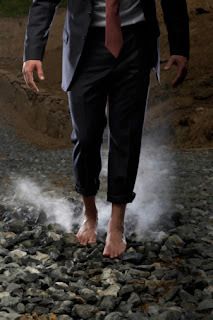 "Fire walkers are instructed to pay close attention to their thoughts, since those very thoughts are the way in which we create our own realities," Robbins claims on his personal website. "The implications of 'mind in matter' are truly exciting and can offer new hope to people with severe illnesses as well as anyone seeking to overcome limitations imposed by old beliefs: salesmen, students, athletes..."
In recent years, it's become particularly prevalent as a career-oriented confidence booster and a team-building exercise. Some corporate conventions use it as an opportunity to show vulnerability and support in a neutral, non-competitive setting. In 2002, a management development conference offered an optional fire walking exercise for 180 Australian KFC executives. Thirty of those who opted in suffered burns as a result. The practice involves coals heated up to 1,000 degrees Fahrenheit, divided into lanes which participants swiftly walk across. Modern day rituals come with hours of pep talks and preparations about the power of mind control. According to Robbins, the sensation of burning is largely mental. "You can change the reality in your world by choosing to believe and experience something else," he's stated in one of his lectures. But physicist Bernard Leikind, who tried Robbins' fire walk years ago, has a different theory of why walking across burning coals is often less dangerous than it seems. "You're walking on things with poor thermal conductivity and poor heat capacity," he says in a Scientific American video. "Even though the coals are at a high temperature, they don't have as much energy as you might think and aren't good at putting it into your foot." According to Leikand, you don't need confidence or a heightened mental acuity to fire walk successfully, you just need science and a little bit of luck. "Throughout the course of the walk, energy moves from embers to feet, then the walkers' blood carries some away," Leikand tells Yahoo! Shine. "If the energy carried away doesn't equal the energy moving in, then the tissue's temperature will increase... The degree of a burn arises from a combination of temperature and time...If they make it to the end before any damage occurs, the fire walk was successful." As to why so many weren't successful, Leiklind speculates: "Some people may have walked slowly. Some people may have stepped out of the path of earlier walkers into deeper, hotter coals. Some people may have jammed embers between their toes. The organizers may have built their ember beds differently than they had before, perhaps on a different surface. Gusts of wind might have increased the rate of combustion. It's really hard to say." He does believe other participants who suffered less severe burns may not have even reported injuries. "They just would have headed for home and visited their physicians or the emergency room later." So why do it? And, furthermore, why drop upwards of $600 for the privilege, which thousands did at Robbins' recent event? Part of the appeal may be the heightened adrenaline rush from the threat of injury. "I'm glad I felt the pain," 18-year-old Madina Kaderi, who suffered burns from Robbins' fire walk on Thursday, told the Times. Another draw is the desire to prove something to yourself. "It transformed people's lives in a single night," Carolynn Graves, a 50-year-old a real estate agent told the Times, after her successful walk. "It's a metaphor for facing your fears and accomplishing your goals." Tolly's speech at fire walking seminar recently suggests not only an emotional investment, but a financial one as well. "The next time you're in a situation used to intimidate you, you'll remember I could do that," he says of the experience. "Certainly I can go in there and ask for a raise."